Aaaahhhhhhhh! So begins my annual scream at the world to listen to a new album by Mike Gale’s Hampshire and Oxfordshire based band Co-pilgrim. Gale is a purveyor of fine songs. Sometimes uplifting, sometimes melancholy, often with an alternative country twang but always with a strong sense of melody. His releases have oodles of pop sensibility and annually I despair that he is not being listened to in every home. Each year he produces a strong album. This is his fourth in as many years, and it is another exceptional collection. However, there is one key difference here to previous releases. That scream of frustration you heard earlier from me is something that is perhaps boiling up inside Gale too. Here he’s dusted off his distortion pedal for two belting 90s US college rock openers, Turn It Around and the excellently titled You’ll Look Pretty As A Picture….When The Acid Rain Hits Ya. The gain has been cranked up – Mike means business. He then rifles down the back of his sofa for the Sigor Ros manual of main stage festival performances for the stadium sized epic Cynlidrical Fire Escapes. Best of all is the title track. Sandwiched in the middle of this eight track album (or at the end of side one if you are of a vinyl disposition) and sounding like Velvet Underground and Nico with a sense of humour. There are some great backing vocals here from Claire Bennett too. Speaking of Bennett, she is a star on this album with her Kim Deal-esque vocals enlivening Cynlidrical Fire Escapes in particular. Over on the last half of the album it’s a quieter affair. Gale has unloaded his troubles through the four fuzzed up earlier tracks. It’s time now to sit by the piano, perhaps in a smoking jacket and explore some new musical directions. On this second half there is some sumptuous chamber pop on Thank My Stars. There’s familiar alt-county melancholy on I’m Not A Wallflower, I’m The Wall. He then travels back to the late 1970s for a Wings-like ‘slowie’ called Digging Holes In The Whites Of Your Eyes. Proceedings end with the upbeat horn section and calypso vibe of Wouldn’t You Like To Dance. An album of two halves? Definitely. But they both work well together, showing a broad range of styles all brought together by the recurring search for a mythical utopia called the ‘moon lagoon’. We learn from the press release that this is an album borne from loss, the death of a parent for Gale. We also discover he suffers from a debilitating agoraphobia. Often his albums show an uplifting sense of optimism out of such adversity and in this regard Moon Lagoon is a very typical Co-pilgrim album albeit with a far keener sense of ambition than its predecessors, which for this reviewer makes it Gale’s best yet. 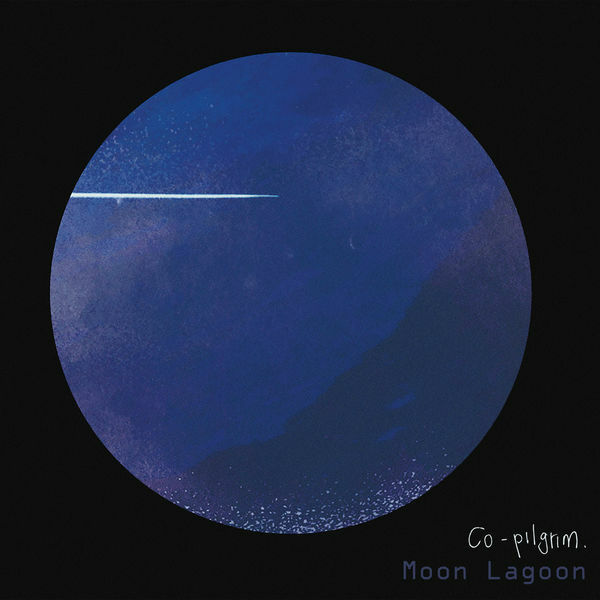 For more information about Co-pilgrim including details about Moon Lagoon visit their website here.